When a user leaves your organization or changes positions, you may need to reassign their incidents to another user. The Batch Reassign feature allows you to do this quickly and easily. Click on the name of the user you would like to reassign incidents from. Hover over the Shortcuts menu and click Reassign Incident. 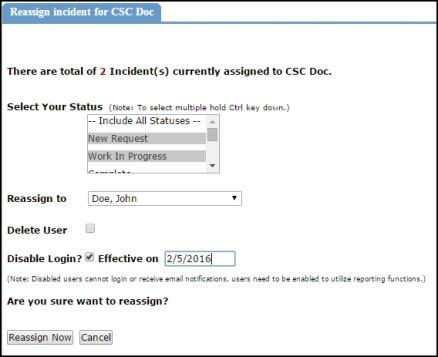 Select the Status(es) of the incidents that you want to reassign. You can select as many statuses as needed. 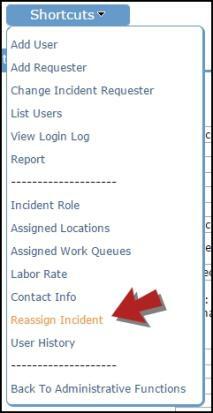 Select the user that you want to assign these incidents to from the Reassign To drop down. You can also delete or disable this user from this screen. We recommend disabling a user account rather than deleting it to preserve the history of the incidents associated with the user account.